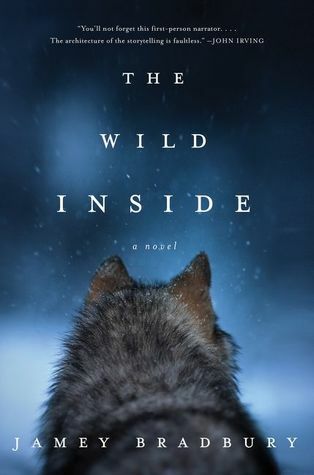 The Wild Inside by Jamey Bradbury is a so-so debut horror/rural noir novel set in Alaska. Tracy Petrikoff, seventeen, has been raised hunting and trapping, as well as caring for the family's sled dogs, in Alaska. She runs wild in the wilderness and gets her strength from it. It has been nearly two years since her mother's death, and her father, Bill, is still recovering from her death. Now she has been expelled from school, her father is trying to load her up with chores and limit her time trapping and running through the woods. Tracy wants to enter her first adult Iditarod, but her father isn't listening to her. He was a champion musher, but has essentially retired now. When Tracy goes out to check her traps, a stranger attacks her and knocks her unconscious. She comes to with her bloody knife lying nearby. The next day a man emerges from the woods onto their property with a deadly knife wound. Did Tracy inflict the wound with the hunting knife she always carries? She can't remember, but he seems to be familiar. Tracy keeps all her thoughts to herself and doesn't tell her father what happened. Positives about the novel were the beautiful descriptions of Alaska. This book evoked a rollercoaster of emotions for me, however many of them were not positive. There is one thing Tracy does, aside from her horrible grammar, which made the book almost a "did not finish," something I don't do lightly. Tracy's bad grammar will grate on many readers nerves after a while in this first-person narrator; it's just a fact. Tracy is feral in many ways. The one activity that Tracy does, which I won't describe, is disturbing. There is a description/revelation of it that happens early in the book, which really cemented my averse reaction to Tracy as a character. Sometimes something is simply too weird for some readers. Take note that there is no mention of any supernatural elements in the description, which would have steered me away from this book.